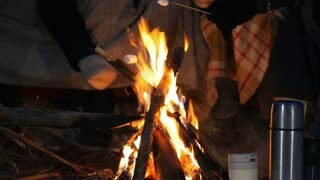 Group of happy friends sitting in winter forest by the fire and eating marshmallows. A young man playing guitar. Group of friends in winter forest having a good time. Sitting near the bonfire and eating marshmallow.